Order this compressor now and you will receive quiet equipment with excellent airbrush capabilities. Silentaire Sil-Air 50-9-D Our Sil-Air compressors are engineered with artists in mind. 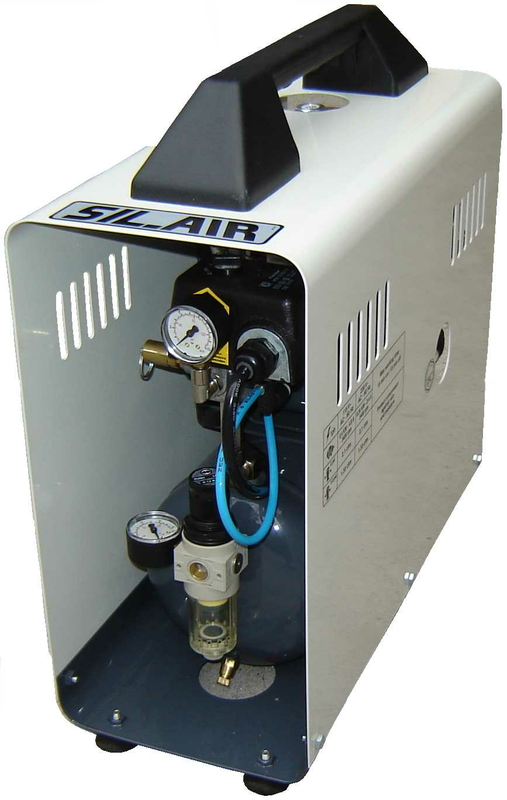 This Sil-Air unit has both an air pressure regulator and a gauge to ensure a controlled, consistent air stream with minimal spray pulsation, allowing you to focus on your art without having to worry about pressure changes. Plus, component-heat and climate produced condensation is kept out of the line via a moisture trap, giving you even more peace-of-mind. Another advantage is a tranquil workspace. The Silentaire Sil-Air 50-9-D is very quiet, allowing you to concentrate on your art rather than facing noise distractions. The safety valve and air intake filter protect your compressor, while a convenient carrying handle or wheel provides portability for the artist on-the-go.